I also ran a shorter section of cord through each shorter channel along the sides. On one end of this cord I attached a small wooden toggle so that the cord could not pull back through the channel. On the other side I attached a cord lock. Using this, I can cinch the short ends together so that the ends will cradle around the hammock, (hopefully) eliminating any drafts. Now, it was time to take it out and hook it up. First (due to the vapor barrier effect of the mylar sheet) I made sure to position the under quilt with the mylar sheet closest to the underside of the hammock. Then I attached one of the carabiners to the whoopie sling at the foot end of the hammock, and then the other carabiner to the whoopie sling at the head end. After this I tucked the hammock inside the under quilt, lined up the under quilt around the area I would like it to be, and then cinched the ends of the under quilt together. 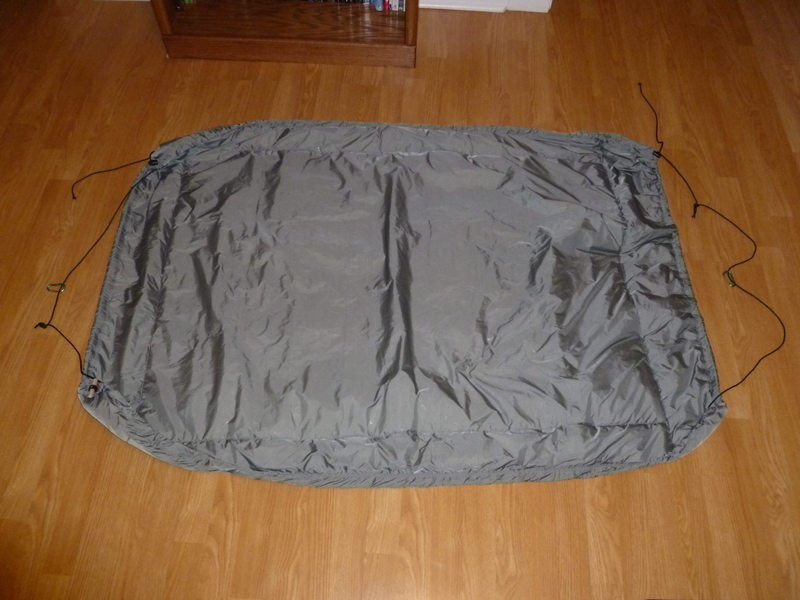 This entry was posted in DIY/MYOG, Gear, Under Quilts and tagged 3 mm cord, DIY, Hammock Gear, Hammocks, mylar sheet, MYOG, PolyFil, Quilt Batting, Ripstop Nylon, Underquilts. Bookmark the permalink. Thank you. 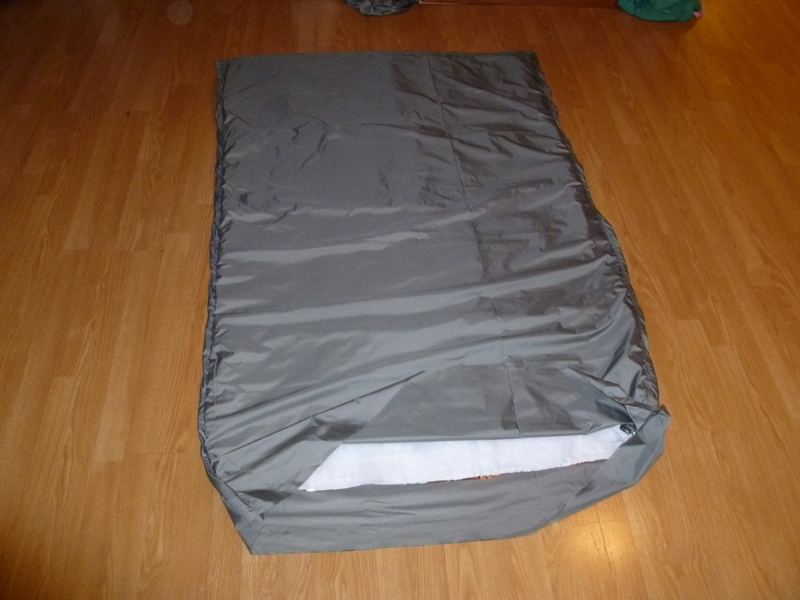 A very clear pattern and demonstration for a very inexpensive underquilt. I had bought the exact material from wslmart, ready to follw a much more difficult pattern, until my nro, biscuit, directed me here. Bravo. Have you used this UQ with the mylar in cooler temperatures (too hot at 70 F)? Does the mylar make it too hot at cooler temperatures (like 40 F)? Other than “crinkly” is the mylar “a good thing”? My son has actually been the one to use it on 2 occasions. The coldest was high 40’s (F) and he said he slept fine, didn’t get cold…but it can be hard to get a detailed answer out of a 9 year old at scout camp though… 🙂 But yeah, I usually throw an UQ on if the temp gets to about 65 of below. It is amazing at how cool the air can be against my back even in temps as high as 60. 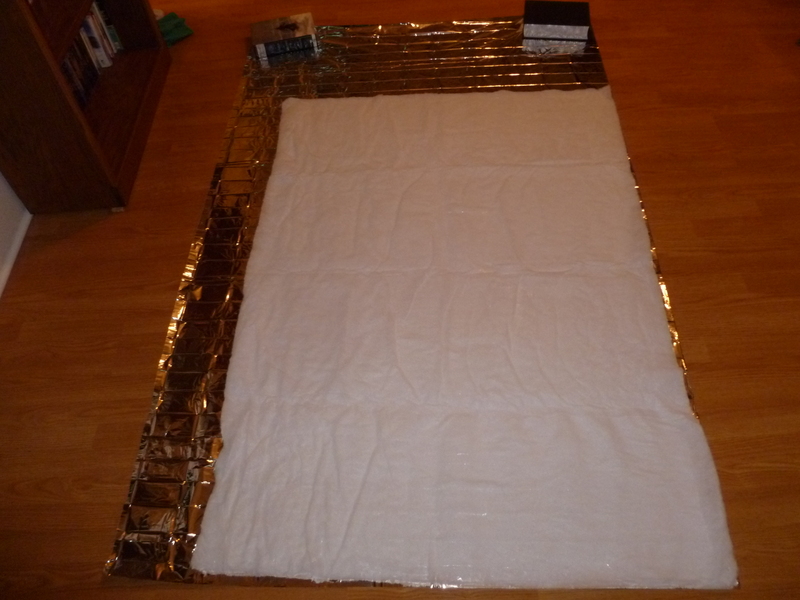 As far as the mylar, of course it does reflect heat back, which was the reason I used it with the insulation. And yep, it is very crinkly…not necessarily so bad whenever you are laying in it, but it is noticeable if you are moving it around. Also, when sewing the mylar…if I ever do it again, I will set my stitches to be a little wider and go with a zig zag pattern. The problem now is that I have somewhat perforated the mylar and one spot about 7″ tore apart at the seam so I had to go back and add in a seam below it. That’s great, Stick. I love it. 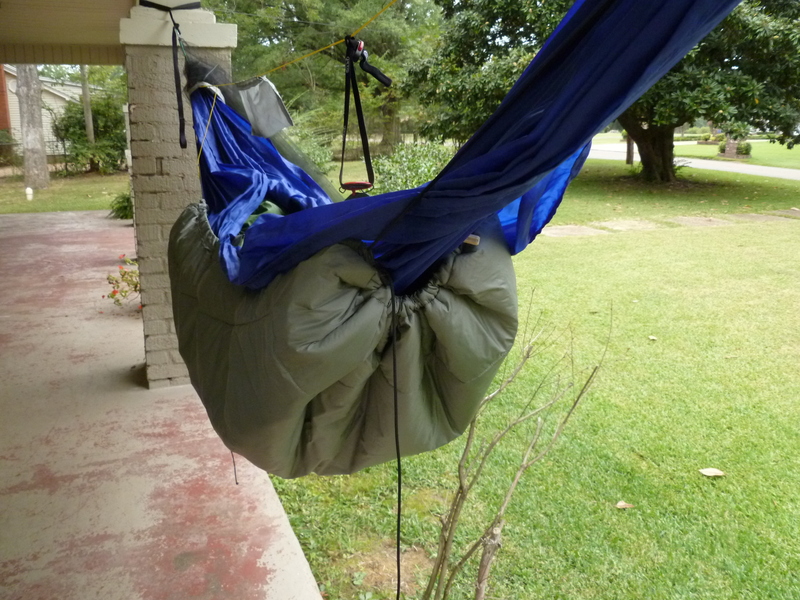 I’m waiting on an UQ from Hammockgear, too. I wish I had the skills for DIY project like that. I’m working on it. Gotta learn to sew, man! I’d love to make stuff for my daughter. She’s young so I don’t have to worry about weight because we just car camp for now. Learning to sew is really not hard at all…at least basically! 🙂 To be honest, the hardest part for me was getting the bobbin down. And now that I can do it the right way, it is pretty simple. When I decided I wanted to try to figure it out I went to Wal-Mart and bought a Singer for about $80. Then I took it home, read the book a little and then got started. And luckily, I still haven’t sewn up my fingers! So, what kind of UQ are you getting from HG, and when do you think you will get it in? I really was hoping that my stuff would have been here Saturday, but oh well, I am hoping for Tuesday now. There has been some confusion getting my stuff out to me and there has actually been a delay on getting my top quilt. But when I called Adam last week he said it was all in the mail. I still have not gotten an email notification saying it has been delivered though, so I guess the only way I will know is when it shows up at my door. I’m waiting on a Summer Phoenix, with an extra ounce of down. I’m a fair weather guy and don’t get out in the cold stuff too often. Being in southern CA means I don’t need very robust insulation unless I head to the serious elevations. I ordered on Aug. 19 and still am waiting. I haven not heard anything via email, i.e. that the order has shipped. But Paypal went through so I expect it soon. My item is somewhat customized so I expected some wait time. But I hope it’s here by my trip next week!! I won’t panic unless it’s not here by this weekend. I almost went with the Summer Burrow, but when he added the 50 F Burrow at a lighter weight on his site, I figured that was for me! 🙂 Anyway, my order knocked on my door today! I am now the proud owner of a overstuffed 50 F Burrow (in M90) and a sweet cuben fiber 20 F Phoenix, also with an oz of overstuff! I also just got off the phone with Adam about 20 minutes ago. He assisted me in explaining some things for almost 40 minutes! Can we say customer service? Anyway, I am happy with my products and thankful for Adam and Jenny’s services. I am sure you will be too once you get your items! Nice job Stick! My DIY project will have to wait for the snow to start flying (so, I am hoping I never get to start it :)). Your quilt looks good and should keep you warm. I don’t think the weight is all that bad for a 60 inch quilt. You are gonna love your quilts from Adam and Jenny. They make very high quality stuff. I new you were gonna get hooked on hammocks! Thanks Green Giant. 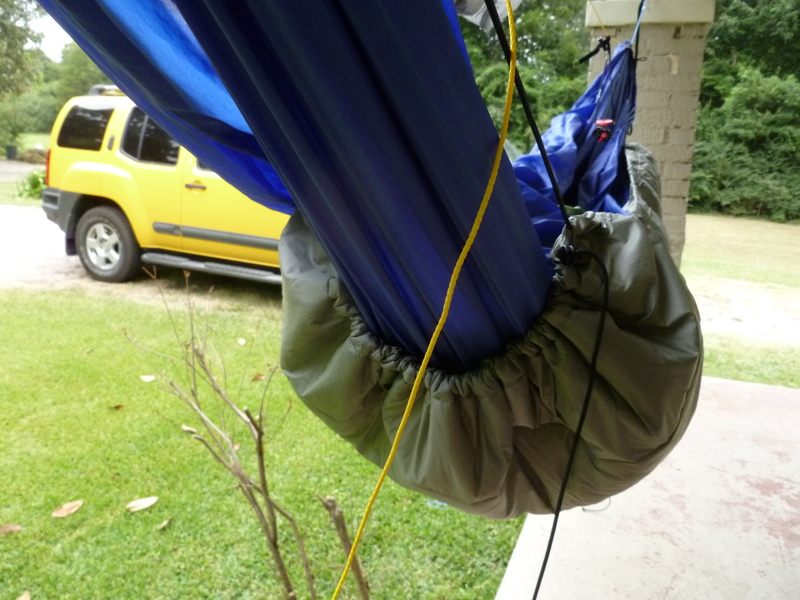 And thanks for your post a while back on the GT UL hammock…it is what made me interested in the hammock to begin with. So, I really have you to thank for giving me a reason to give hammocks a try…and I am glad I did! I’ll apologize then…because it is addictive! The GT UL isn’t the be-all-end-all of hammocks. 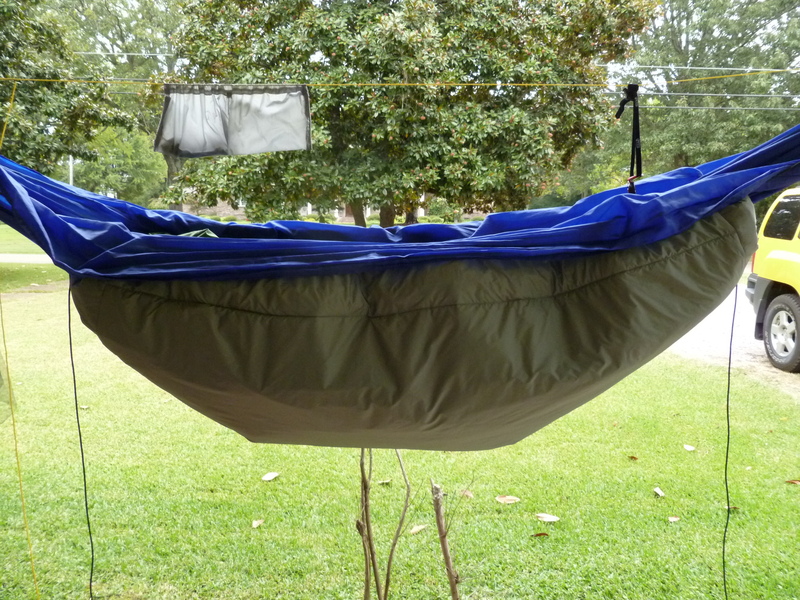 In fact, it is really no different than many of the entry-level hammocks on the market. But, it is a nice and inexpensive toy which people like you and I can tinker with to see if we like hammocks. You’ve definitely taken it much further than I did though which will hopefully serve you well. Haha…that’s cool! At this point, it is obviously the only hammock that I know first hand, however, I am plenty happy with it. Once my UQ arrives, and along with my Bug Sock, I should be able to use it in a few different settings which will be cool. Although, I will admit that it hasn’t turned me away from tents and tarps and ground sleeping either though…Anyway, thanks again!